European markets turned lower on news of the rejection, with Germany's Dax falling 1.2 percent and the Athens stock exchange down 3.3 percent. "Certain institutions insist in not accepting equivalent measures suggested by the Greek government," Tsipras told his colleagues before departing to Brussels, according to a statement. "The non acceptance of equivalent measures has never happened before. Neither in Ireland nor in Portugal. Nowhere!" He added: "This strange stance could be hiding one of two things. 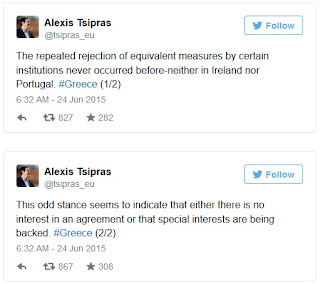 They either don't want a deal or they are serving certain interests in Greece." The prime minister also took to Twitter to update on the latest developments (click on image). It came at crunch time for Greece's continued membership of the euro zone. On Wednesday evening, the Eurogroup of euro zone finance ministers is due to discuss reforms for Greece. These are likely to involve concessions from the Greek government on surplus targets, which many analysts believe to be astonishingly optimistic; pensions; VAT and privatizations. If the proposals are approved, which now looks far from certain, Greece will get 35 billion euros of EU funds for economic development until 2020. Dimitris Koutsoumbas, general secretary for the Communist Party of Greece, said the Greek people shouldn't accept an "antidemocratic agreement" with the EU. "We need a complete plan—an exit from the euro zone and the currency won't solve everything," he told CNBC on Wednesday. "The attitude of the European Union and Germany is unacceptable. Past Greek governments are also responsible." And given this discontent, the chances of a second election this year in Greece are rising. Tsipras's Syriza-led coalition only has a 12-seat majority, and may have difficulty selling the new deal to its own MPs. There will "probably" be another election this year in Greece, Panagiotis Karkatsoulis of the centrist To Potami party, told CNBC. However, Makis Voridis, an MP from New Democracy, the center-right party defeated by Syriza in the last elections, said another election would put the country in "big trouble." Michala Marcussen, global head of economics at Societe Generale Corporate and Investment Banking, reflected the opinion of many in the markets on Wednesday morning when she told CNBC a Greek deal will "most likely" get through a Greek and German vote. Market reaction to Greece has been quite calm compared to what has happened in the last few years, aided by the European Central Bank's expansionist monetary policies, Marcussen pointed out. As the central bank will likely have to lead the policy response in the event of Greece being forced to leave the euro zone, this level of trust from market participants is important—but if it slips, more trouble likely lies ahead. The Telegraph's Isabelle Fraser also reports, Greek crisis: deal unravels as both sides reject reform measures before crunch finance ministers meeting. Left-wing Prime Minister Alexis Tsipras was elected in January on a promise to end years of austerity that contributed to a 25% slump in the Greek economy. The reality of an accelerating bank run, and the prospect of a chaotic exit from the euro, have forced Tsipras to backpedal, but the budget savings he is now proposing risk prolonging the recession that Greece has sunk back into this year. Experts say there's too much emphasis on raising taxes and pension contributions, and not enough on cutting spending or making the economy more flexible. Berenberg chief economist Holger Schmieding said Greece risked repeating the mistakes of its first bailout program, by hitting demand in the economy too hard. 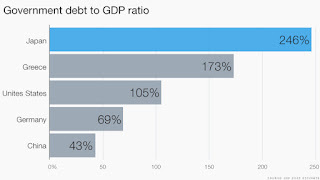 Greece has the second highest debt mountain in the world based on the size of its economy. Until recently Tsipras, and his combative finance minister Yanis Varoufakis, were insisting that relieving that burden had to be part of the agreement under discussion. Senior European officials -- mindful that their own taxpayers won't accept a haircut on the money they've loaned Greece -- killed any talk of that Monday after a summit of eurozone leaders. 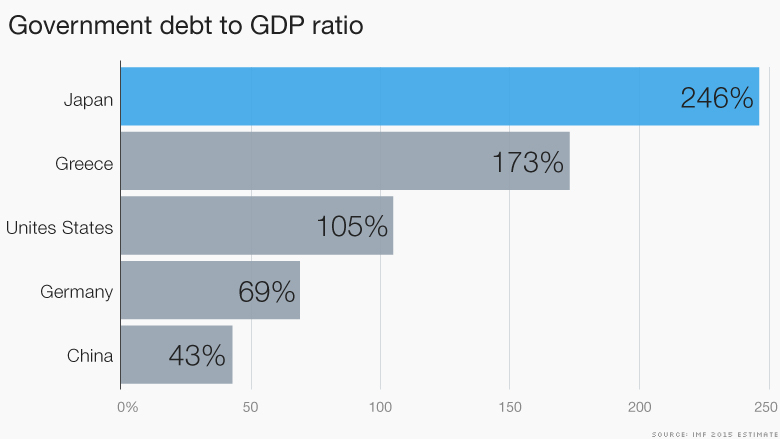 But economists say Greece won't grow fast enough, or generate big enough budget surpluses, to service its enormous debt any time soon -- even given the extremely low interest rates and deferred payment schedules attached to the international bailout loans. "We disagree with the proposal's suggestion that the intended measures will lead to a return to debt sustainability for Greece within 10 years," commented analysts at UBS Wealth Management. "If this week concludes with agreement between Greece and its creditors, it won't be long before the next chapter in this drama," said Angus Campbell, senior analyst at FxPro. UBS estimates Greece may need additional funds of nearly 14 billion euros to carry it through to the end of 2015. "Greece therefore needs a new funding program, a debt restructuring or a combination of the two," wrote analysts at the Swiss bank. 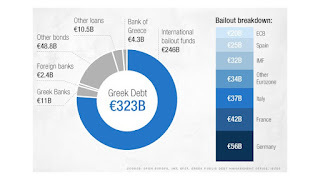 As Greece's lenders scrutinize the bailout proposal, let me offer you some additional thoughts. Tsipras went back home saying they saved "pensions and public sector jobs." Why did he do this? Simple, the people who voted for SYRIZA are pensioners and public sector workers. But the truth is he didn't save anyone. The 23% proposed rate for the valued-added tax (VAT) is steep and will hurt pensioners on a tight fixed income very hard. Of course, he once again "saved" public sector jobs (like all previous Greek governments) but for how long and how did he achieve this? How else? By taxing the ever shrinking private sector which is the only engine of growth in the Greek economy. And as any economist will tell you, in a depression, more taxes will lead to more unemployment and more tax evasion, which is already rampant in Greece. And all this is happening during peak tourist season, adding more uncertainty to an economy already on the brink. Do you think European tourists on a tight budget are going to visit Greece if they're going to get clobbered with a 23% VAT tax? Of course not, most of them will just go to Turkey or elsewhere. And I'm completely dismayed by Varoufakis's "great game" and how he and Tsipras after months of wrangling and posturing didn't at least secure additional debt relief for these insane proposals. If they're willing to accept the imposition of more harsh austerity which will sink the Greek economy further into debt, you'd think they'd have the brains to demand additional debt relief and more growth initiatives. 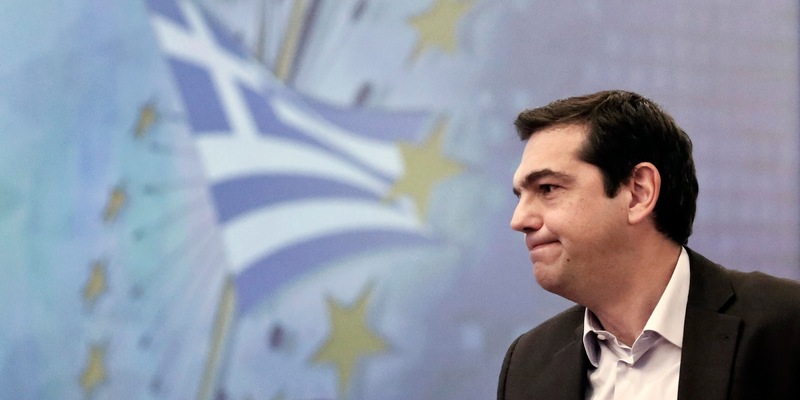 Back in Athens, the government’s junior coalition partner, the small right-wing Independent Greeks party (Anel), has made resolution of Greece’s debt problem, a precondition of its support of any deal that is eventually reached, reports Helena Smith. Parliamentary endorsement of the agreement would be premised on whether the debt issue was tackled with a legal commitment on the part of creditors to some form of debt relief, party members said. Elimination of tax exemptions on Greek islands was another red line that the Independent Greeks would not cross “even if the government falls,” Kammenos was quoted as telling MPs. Now, I don't really trust Panos Kammenos and think he'll do anything to remain defense minister, but what if he breaks off from this coalition government? My contacts in Greece tell me To Potami party will step in to avoid Greek elections and Grexit but this is far from certain. And what if enough SYRIZA hard liners reject this deal? What then? There will be no time to call snap elections as payments to creditors are due at the end of the month. I happen to agree with the IMF, forget tax hikes and focus on cutting the bloated and inefficient public sector. I would approach Tsipras and Varoufakis with an offer: cut the public sector by 30% and we can cut the debt by an equal amount and focus on growth initiatives. They can also leave pensions alone if such cuts are agreed to. Of course, as I repeatedly tell you, no Greek politician has ever cut the public sector because in a country where the ratio of public to private sector workers is ludicrously high, any job cuts to the public sector are tantamount to political suicide. But with the country at the brink, this is the time for hard decisions and I think the IMF is right to play hard ball on cutting expenses. A lot of bloggers came out too quickly to state an eminent deal is in the works. No such deal has been finalized and time is running out fast. At best, I see another "extend and pretend' deal but this isn't satisfactory and puts off the inevitable hard choices for the future. Meanwhile, the euro deflation crisis rages on and can make it that much more difficult to come to a long lasting agreement in the future. This Greek debt crisis is a complete mess. It wasn't handled right from the get-go. Creditors should have demanded deep cuts in the public sector in exchange for debt relief and investment projects. Instead, each Greek government including SYRIZA has proposed measures which will once again disproportionately hurt the private sector and leave the bloated and inefficient public sector intact. Go back to read Theodore Economou's insights in my comment on managing a Greek default. If they don't strike a deal, you need to prepare for Graccident and even if they do strike a deal, unless it's comprehensive and includes debt relief and growth initiatives in exchange for deep cuts in the public sector, Grexit will only be postponed, not laid to rest once and for all. And Harvard economist Larry Summers explains why Germany's strategy won't work for Greece. Listen carefully to Summers, he's one of the best economists in the world and a close friend and confidant of Bridgewater's Ray Dalio. He's right, asinine austerity measures being imposed on Greece will backfire but there needs to be deep cuts in the Greek public sector in exchange for debt relief and investments. I’m here in Athens with Syriza. I’m told that the reason they can’t cut back public employment — even the patronage jobs of PASOK and New Democracy — is because they can’t get it through parliament. Otherwise, they would be all for it, so I’m told. Everything seems up for grabs here. A few blocks from Syntagma square, half the shops on major streets are closed up, gone out of business. But Greeks have been buying cars as “hard currency assets” to prepare for drachma. I strongly doubt SYRIZA's leaders would have agreed to any job cuts in the Greek public sector and fear the worst lies ahead if the drachma comes back. Let's hope cooler heads prevail from all sides.